The Dallas Mavericks Held on for Dear Life in Defeating the Trail Blazers 108-104. The Blazers played a very tough game last night against the Mavericks. Unfortunately, Portland was on the losing end of this one. It was an extremely tough game because it now moves Portland to 22-29 for the season, fourth in the Northwest Standings and ninth in the Western Conference. 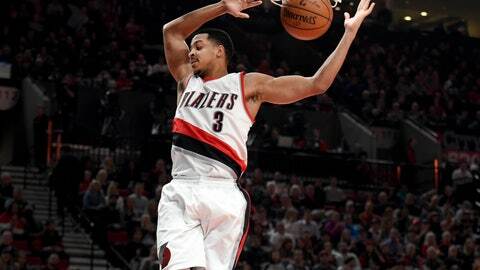 Portland didn’t dive too deep into their bench for this one, with C.J. McCollum leading the way for the Trail Blazers. He scored 28 points on 11-20 shooting from the field, 2-7 from the three, and a perfect 4-4 from the free throw line. The main bench play came from Noah Vonleh‘s seven minutes of playing time after starting the game. Al-Faroqu-Aminu gained most of his minutes with 14 points on 5-10 shooting and 4-8 from the three point line. Damian Lillard had rough night, going 4-20 and ending with 13 points. The best part of the night came from Evan Turner stepping up to score 24 points on 10-17 shooting. He was able to pick up the slack from a rare misfire from Damian Lillard. Lillard went 4-20 and finished with just 13 points, so Turners play was very encouraging for the future. The Dallas Mavericks were led by rookie Yogi Ferrell, who scored 32 points and went 11-17 from the field and a stellar 9-11 from three point range. Ferrell just signed a two year deal with the Mavericks after defying expectations on a 10-day contract. Wesley Matthews contributed 27 points on 8-17 while Seth Curry 19 points on 7-12 shooting. It’s nice to see some new scoring from the Mavericks, not having to rely on Dirk Nowitzki like the old days. Tough loss, thought we had it at the end with a crazy comeback, but it just didn’t pan out. Want your voice heard? Join the Rip City Project team!